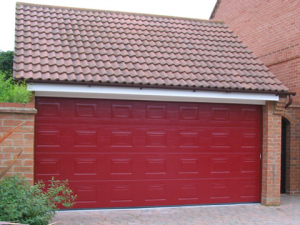 Having a garage door which is operated at the push of a button can be a real convenience. You no longer have to battle against the elements or struggle to lift the door on your own on a cold, dark night. One thing people often find after having had their door for a few years is that faults can develop due to wear and tear, the weather and accidental damage. This month we’ve collected some top tips for identifying and fixing some common garage door faults. At the top of the list for common garage door faults is when the door itself won’t open. It’s frustrating for so many reasons and could be the result of any number of faults. The first thing to do is to check that the power is working; perhaps your remote is dead or perhaps the motor unit is not plugged in. If your door still won’t open after trying to fix the power problem then it could be that the springs are broken or that the tracks are bent. This may require professional assistance to avoid further damage. If you find that your garage door is juddering when opening or closing, or if your door makes a squeaky noise as it rolls up and down, then you might want to lubricate the rolls and the tracks for your door. If there isn’t enough lubricant for the action of the door it will cause the door to stick, possibly getting stuck at certain points in its operation. Ensure you have help when lubricating your door as it is easy to trap your fingers and injure yourself. Having a door which won’t stay open or which droops when at the height of its lift can be troublesome. The main reason for this is that the springs aren’t holding as they should, you will need to have your springs adjusted to give your garage the ability to hold the weight of the door. If the issue is not with the springs, then move onto our next tip to learn about doors which automatically reverse. A door which won’t stay open and reverses at will can be both dangerous and damaging. Clearly the door thinks the measurements of its action are off and the main reason for this happening is if the close limit switch needs adjusting. Similarly, if you door won’t open all the way then the limit switch may be too close to the motor; move the limit switch to try and solve this issue. 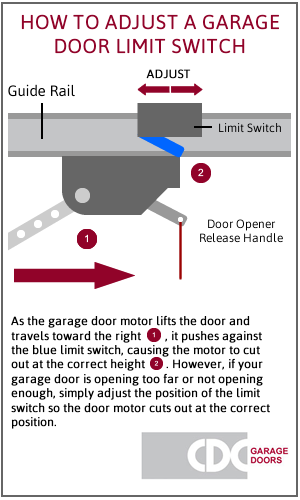 As the garage door motor lifts the door, it pushes against the limit switch (in blue in the diagram) causing the motor to cut out at the correct height. However, if your garage door is opening too far or not opening enough, simply adjust the position of the limit switch so the door motor cuts out at the correct position. 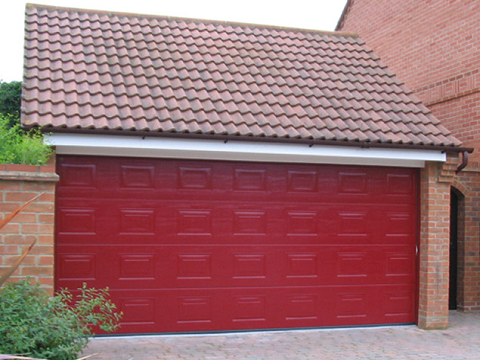 At CDC Garage Doors we’re experts in garage door repairs and we know how important your garage is to you. With over 25 years of experience and a team of fully trained professionals we can ensure that your automatic garage door is repaired in no time at all. To learn more about our repairs and accessories simply contact us today and we’ll be happy to assist you.